Soft, comfortable and so light babies won’t even notice they’re wearing it! The Bedhead Baby Flap Hat is a child’s best introduction to sun safety and can be worn from birth. Specifically designed to be worn in prams and baby carriers, the hat sits comfortably over ears while the soft back flap lies flat under baby’s neck when they’re in a pram. 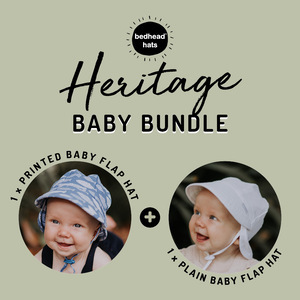 Our Heritage Baby Flap Hat is made from a silky-to-touch woven cotton fabric with an 8-way stretch. Along with our anti-flop brim and UPF50+ excellent protection rating, it’s the sun hat that sets them up for a sun-safe childhood.